There was a strong wind warning and a forecast for rain on race day, so I didn’t sleep well the night before. Believe it or not, I was actually hoping the event would be called off – not a good mindset for race day. When I looked out the window there wasn’t much wind but it was raining heavily. I would’ve been happy to go back to bed. We ate a good breakfast, packed our gear and headed off to the swim start at Palm Cove still hoping that the race would be called off. Once we arrived at Palm Cove, the first job was to setup our bikes which included checking tyres, attaching water bottles and storing our nutrition. The transition area where the bikes are placed was already a mud bath and just staying on your feet was a major achievement. With preparations done it was off to the swim start to see what we were in for and whether the ocean would be kind to us. It wasn’t flat but it had settled down since the previous day. This was still going to be a tough swim. After saying our goodbyes to Team Winwood, we headed down to the beach for the race start. I was concerned about the rain, wind and cold having adverse effect on my breathing and had told my family if I started going downhill, I’d pull out of the race. Starting a race in this mindset was new territory for me, but I decided to get going and see how the day panned out. A quick good luck kiss with Leanne and we were off. 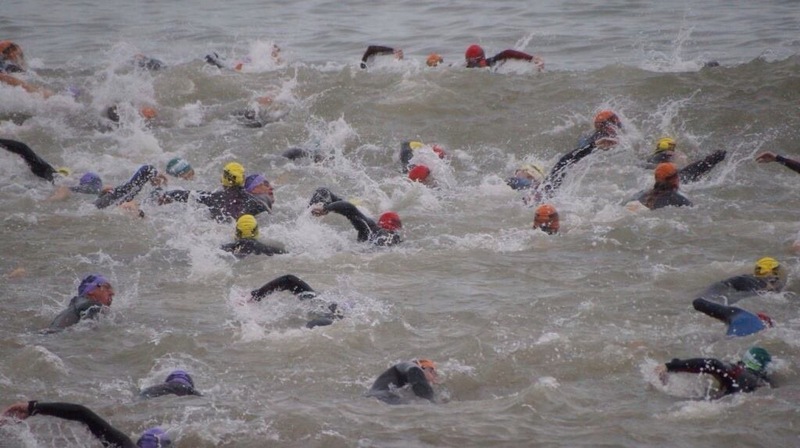 The swim was the toughest I’ve done with rolling swell and current to contend with but my breathing was controlled and my stroke was strong, resulting in a 1-hour 36-minute swim, quite pleasing in those conditions. Trampling through the mud in the transition area to collect my bike didn’t do my mind any favours but every competitor was in the same boat, so I just kept going. I started to think about my family making their way to Cairns and how disappointed they’d be if I didn’t finish, and how Leanne was struggling with injury but still battling on. Then I saw the Cairns Ironman inspiration, Sharn McNeill. Sharn has a rare, aggressive form of motor neurone disease (MND) known as amyotrophic lateral sclerosis (ALS). With the help of some dedicated friends, Sharn was competing in Cairns Ironman. I credit seeing her compete for getting my mind straight. She is an inspiration, please read her story. I couldn’t work out why my legs had no strength, so I adjusted my gearing to compensate which proved successful; within 20 minutes I was back on the pace and determined to clock up Ironman number three. Apart from the rain, the bike course was sensational with rainforest on one side of the road and ocean on the other. A few more hills than I’d like, but some exciting downhill sections. It was a 7-hour, 50-minute bike leg: one minute quicker than Melbourne. I was very happy about that! Starting the run leg, I had 7 hours and 10 minutes until the end of the race – plenty of time for me as long as I pushed the first 21k. At that stage, I didn’t know how Leanne was going. I’d seen her a couple of times on the bike and knew she’d injured her knee again but was pushing on. The run consisted of three laps of a 14k course in and around the Cairns Esplanade, which was a great atmosphere with plenty of support. Coming into the end of the first lap, my family were together cheering me on and Leanne was with them. 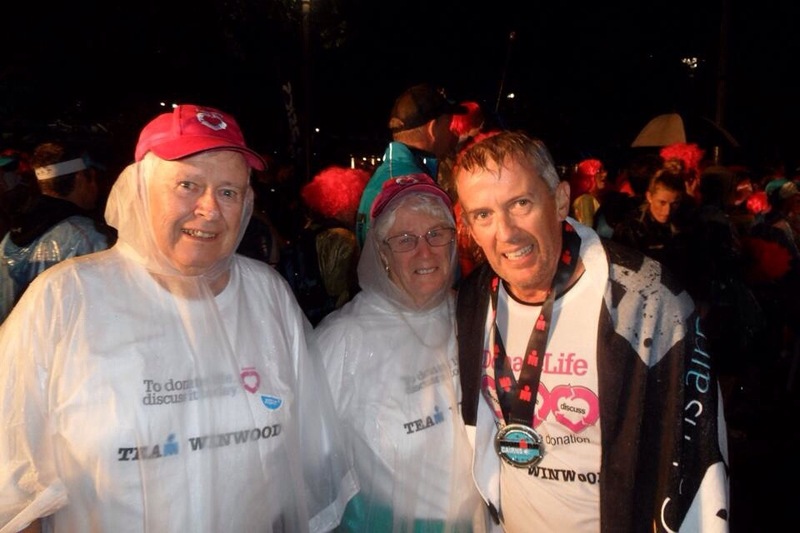 Leanne had to be carried to the medical tent after the bike leg as she couldn’t walk – there was always a chance she would injure her knee again as it hadn’t had enough time to heal after Melbourne. For those of you who have followed Leanne’s journey, you know that although she may not have an Ironman medal, there’s no doubt she is an Ironman. I reached the halfway mark five minutes later than I was hoping for, but I still had 3 hours and 50 minutes to do the last 21k: plenty of time. What I didn’t count on was how bad the course would deteriorate, with sections flooded and other areas becoming slippery mud baths. My pace slowed. By the 28k point, I knew I had to pick up the pace as my feet were blistering badly and at some point they would become an issue along with my breathing. Once I reached the 34k mark I was happy with my progress and had 8k to do in 1hr 50 minutes it was at that point that the jog/walk changed to a walk. The conditions had reduced my feet to a blistered mess and, as I’d expected, my breathing had become quite laboured. With the great support of family, friends and the Cairns public, the last 8k went by pretty quickly – before I knew it I was soaking up the finishing chute atmosphere. I was amazed at the people still around in the rain late at night, cheering us back markers home. For me, that is what makes Ironman special. So 16 hours and 32 minutes after I jumped into the water at Palm Cove, my race was done with a 3-minute PB – a very satisfying result considering the conditions and my mindset before the race. A special mention to my coach Toby for getting me to Cairns better physically prepared than I thought I was – even in the last minutes leading up to the start of the event; to the Staff of Cairns Hospital; Loren, Angus and Ryan for your support and for organising the fantastic DonateLife media coverage. For more information on organ & tissue donation please contact Loren Ginders on 0419 281 619 or email [email protected] ; Zoe Williams who was an inspiration to me and such a delightful young lady – I was so happy we caught up for a chat; and Sharn McNeill who inspired everyone with her story on Friday night. A big thank you to Jeff Gillies from Ironman for arranging my parents to present me with my finishers medal. Last but not least, my wife Leanne; without her love and support Ironman would not happen for me, she’s my Ironwife! Russell and Leanne you are an inspiration to all. I hope that thousands of people will read all about you and understand that they too can do more than they could ever dream of. Plus of course they might think about organ donation and help others to reach their goals.